A recurrent theme in Underwriting Commercial Real Estate in a Dynamic Market is that good thinking and good underwriting go together. This stands in contrast with "getting an answer" or even worse "reverse engineering" – getting to a solution by assuming that current trends in market pricing is best. 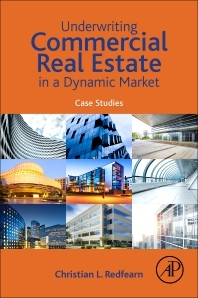 The cases in Underwriting Commercial Real Estate in a Dynamic Market will force readers to recognize that there is no single answer, but rather a range of answers that will depend on numerous perspectives. And, in order to make valuation decisions, they will have to undertake a rich conversation about what constitutes a good trade-off and what does not. Cases can be structured for use with introductory material as well as advanced topics. Case 10: What Inning? What Game? Christian L. Redfearn is the Borstein Family Endowed Professor of Real Estate at the Price School of Public Policy at the University of Southern California. There Prof. Redfearn directed the Dollinger Masters of Real Estate for nine years and introduced the new undergraduate bachelor of real estate development degree. He also is the editor of the Borstein Real Estate Case Series. He joined the faculty at USC after completing his Ph.D. in economics at the University of California, Berkeley. He has been published in the Journal of Urban Economics, Regional Science and Urban Economics, and others. Prof. Redfearn also has also been named a NAIOP Distinguished Research Fellow.